The health benefits of green tea have been proven to reduce the risks of heart disease and certain types of cancer. Green tea contains catechins, an antioxidant that helps remove free-radicals from the body that can damage DNA and potentially increase your risk of getting cancer. Other foods that contain catechins are grapes, berries, red wine and chocolate. Green tea is also minimally processed--it is withered and steamed and therefore the catechins are more concentrated. Now, I do not have a medical background and I'm not a registered dietitian, but I can tell that just by looking at this soup and even better eating it--that the health benefits are pretty amazing! When looking for green tea noodles, read the back of the package carefully. Some products may contain green food coloring to obtain a bright green color. Food coloring does not belong in any food product so stay clear of it. Also, some noodles contain white wheat flour instead of buckwheat flour, which will result in a brighter green color. For this soup I used the buckwheat version, but I have both in my pantry. Place water, kombu, star anise, ginger and porcini mushrooms in a large sauce pan, bring up to a boil and immediately remove pan from heat. Cover the pan and let the ingredients steep for 30 minutes, or more to extract the flavors. Strain the broth and return the liquid to the pan and add tamari sauce and miso paste. 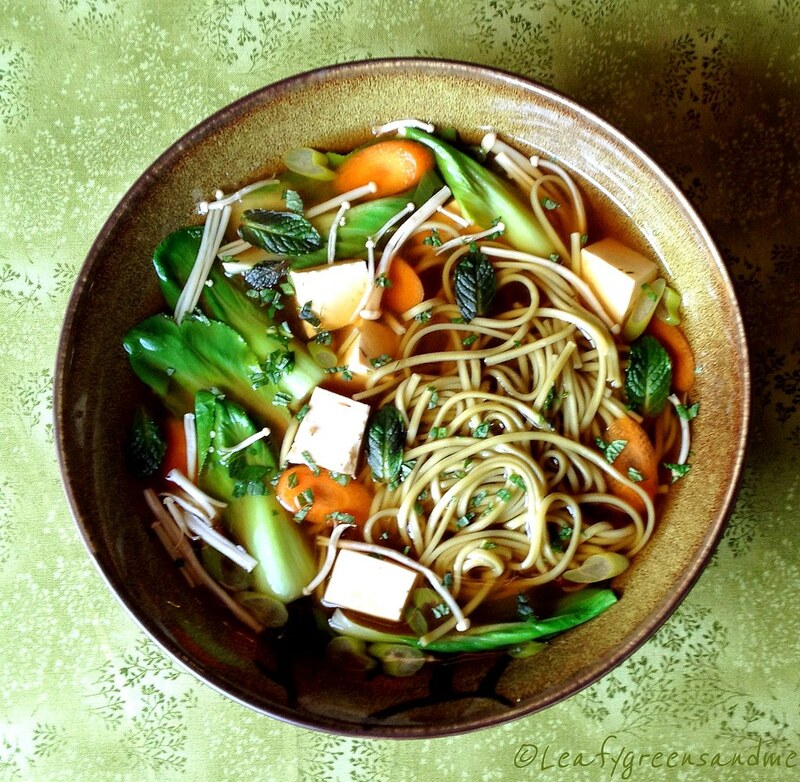 Bring broth to a slight simmer, making sure that the miso paste has dissolved and then add ingredients of choice. I used only organic ingredients in the soup--green onions, carrots, enoki mushrooms, baby bok choy, freshly made soybean cake (tofu found in Asian markets), ChaSoba green tea noodles and fresh mint. But you can add whatever ingredients you like such as edamame, shiitake mushrooms, broccoli, or spinach. I also add the vegetables to the hot soup just before serving and only cook them for a minute or so because I like them to be vibrant and crisp tender. Also, I cook the noodles separately and then rinse them in hot water to remove any starch and then add them to the soup, just before serving. Finally, I garnished the soup with fresh mint, but Thai basil would also be good.